" Lowballing Manhattan again, huh? Manhattan absolutely demolishes Superman. He has a wider array of powers, and is much more powerful than Superman on the grand scale of power. " No, just putting Manhattans power set in perspective for the uninformed masses. Stalemate is the best you can hope to argue for here. Now, go ahead and blow Manhattan out of proportion as you are want to do. No, just putting Manhattans power set in perspective for the uninformed masses. Stalemate is the best you can hope to argue for here. Now, go ahead and blow Manhattan out of proportion as you are want to do. " "@JediXMan: if manhattan can easily manipulate metals and structure them the way he wants cant he do the same to the man of steel? " It's a nickname, he's not actually made of steel. Because Manhattan has yet to do anything impressive enough to imply he can. He busts a bunch of no durability normal folks who can't defend themselves or a tank. His feats involve teleportation and reforming himself, outside that we don't have an inkling that he's going to be making superman explode with a thought. "Lowballing Manhattan again, huh? " Not so much lowballing, the guy doesn't have the feats to say he will wipe Clark out with a thought.
" supes wins he flies around the earth reversing time and stops doc M from getting his powers lol "
"supes wins he flies around the earth reversing time and stops doc M from getting his powers lol "
I don't think Modern Superman has ever done that, Reeve Superman could do that though. please dont tell him that it will be the galactus thread all over again lol, "
Dr. Manhattan would win in my opinion.
" Dr. Manhattan would win in my opinion. " mind if i ask why and how? How is the blue dude supposed to get killed by the dude in blue?
" How is the blue dude supposed to get killed by the dude in blue? " mind if i ask why and how? " Meh I just think Dr. Manhattan has stronger powers, from what I've seen in the movie. Meh I just think Dr. Manhattan has stronger powers, from what I've seen in the movie. " they are a little impressive but most people in comics would look like that if they existed in a world like watchmen too...current superman would along with major members of the justice league...and to be honest manhattan wasn't even that impressive... "
I think bring in more then one place at once (even other planets) is better then Super Speed, he created Air on Mars. Also it was stated he possibly could have turned a gun to steam, bullets to mercury, and a bottle to snowflakes. I think bring in more then one place at once (even other planets) is better then Super Speed, he created Air on Mars. Also it was stated he possibly could have turned a gun to steam, bullets to mercury, and a bottle to snowflakes. " and people like superman can blow out a sun with their breathe and destory a planet with their sneeze and turn coal into diamond, its all a matter of perception, if Manhattan went to DC or Marvel he would get stomped by people like Thanos and Darkseid all the time. in Watcmen he looks like a god. and people like superman can blow out a sun with their breathe and destory a planet with their sneeze and turn coal into diamond, its all a matter of perception, if Manhattan went to DC or Marvel he would get stomped by people like Thanos and Darkseid all the time. in Watcmen he looks like a god. " I haven't seen Superman do anything like that to a sun or a planet (or even stat that he could do that), Dr. Manhattan could more then likely turn coal into diamond easier then Superman. I haven't seen Superman do anything like that to a sun or a planet (or even stat that he could do that), Dr. Manhattan could more then likely turn coal into diamond easier then Superman. " true superman has only ever said he can do that, while Comedian only said Manhattan can do that. i still stand by my point, its a matter of perception. and as for manhattan changing it easier idk, it would be effortless for both of them. and besides superman is not immune to matter manipulation so manhattan trying to blow him up won't work. He has done nothing superman can't handle.
" when has superman been shown to be immune to matter manipulation "
true superman has only ever said he can do that, while Comedian only said Manhattan can do that. i still stand by my point, its a matter of perception. and as for manhattan changing it easier idk, it would be effortless for both of them. and besides superman is not immune to matter manipulation so manhattan trying to blow him up won't work. He has done nothing superman can't handle. " hmm.. I want to see proof of Superman saying he can blow out the sun or destroy a planet with a sneeze. I really can't see what Superman could do to Dr. Manhattan seeing how he can bring himself back from nothing and in perfect health, if they had a fight to the death Superman would maybe run out of power (over whatever number of years or decades they fight for). hmm.. I want to see proof of Superman saying he can blow out the sun or destroy a planet with a sneeze. I really can't see what Superman could do to Dr. Manhattan seeing how he can bring himself back from nothing and in perfect health, if they had a fight to the death Superman would maybe run out of power (over whatever number of years or decades they fight for). " ugh as for evidence i can't find the scan right now but will put it up as soon as i can.
" Manhattan just turns supes's costume and the city into kryptonite hahaha "
how would he know what kryptonite is? how would he know what kryptonite is? " he just does hes crazy like that hahaha i mean the guy has like overwhelming intelligence and cosmic awareness im pretty sure he would no what a rock is "
? and since when did he show cosmic awareness?
? and since when did he show cosmic awareness? " dude im just going by what it says on comicvine ive never seen it either "
He has never shown cosmic awareness. Not even the most outlandish fan generated sites have even claimed this that I have seen. Please, if he has cosmic awareness, back up the statement with proof from the books, don't just throw baseless claims out there, it does nothing to further the discussion. Manhattan is not all knowing, and even if he knew about kryptonite, there is nothing showing he can just produce it from nothing without ever having seen it nor even knowing its structure. He doesn't just automatically know what it is and how to make it just because he is facing Superman. He has never shown cosmic awareness. Not even the most outlandish fan generated sites have even claimed this that I have seen. Please, if he has cosmic awareness, back up the statement with proof from the books, don't just throw baseless claims out there, it does nothing to further the discussion. Manhattan is not all knowing, and even if he knew about kryptonite, there is nothing showing he can just produce it from nothing without ever having seen it nor even knowing its structure. He doesn't just automatically know what it is and how to make it just because he is facing Superman. " Man oh man...the movie argument. The movie version isn't much more impressive than the comic version, and besides, unless stated it is the movie version, then generally the comic version is being argued. Even so, the movie version again doesn't bring much more to the table than the comic version. Stalemate all around. wo calm down man just read my last few post haha "
As for his comicvine bio, it should be updated a little more now, with closer to factual information on the character. Now, the powers and battle rankings portion still attributes stuff to him he has never shown. Honestly, I would be wary of trusting that portion of character bios for any of the characters. Superman defeated Blaze in Hell, who had complete control of the realm, and one of her attacks included trying to transmute Superman into a demon (transmutation and molecular control), who was able to resist through sheer willpower. In Superman Man of Steel #30, he tanked a "force twelve disintegration beam" from a ship the size of a small moon with seemingly no effects at all. And from accounts I have read, he has also tanked and survived an omega beam/effect from Darkseid, which reportedly can disintegrate, transmute, so forth and so on. I would say all of this alone states he is immune, or highly resistant to such attacks. I don't see Manhattan doing much to Supes when it looks like Superman has faced his type of attacks before and survived. Stalemate. I've read all the pages and quotes and people says that there is no facts about Doc powers, but there are facts: he said and showed us that he has control over the constitution of an atom (like turning air into gold) he can change the number of electrons and nucleons in it + it has been proved that he is able to break the laws of physics (it is present in his very basic description) if you combine the two ''powers'' you have a being with full control of the universe, he can do anything.....take supe's powers, teleport him to the core of a red sun, vaporize him......or turning him into ICE CREAM (or turn the tachyon machine into a teddy bear)!!! The only one who can match or beat him is dark phoenix (i think). Superman - Gee Dr. Manhattan i know you can see the future and can become intangible. I also know you can turn my molecules into jelly with just a gesture. Hell you can even read my mind and turn my blood into kryptonite, i mean i know you can just create the kryptonite from nothing but turning my blood into kryptonite just sounds cool. But can you please just stand there and let me beat you up?
" How this fight will go Superman - Gee Dr. Manhattan i know you can see the future and can become intangible. I also know you can turn my molecules into jelly with just a gesture. Hell you can even read my mind and turn my blood into kryptonite, i mean i know you can just create the kryptonite from nothing but turning my blood into kryptonite just sounds cool. But can you please just stand there and let me beat you up? Dr. Manhattan - No *kills superman* i swear to kids sure do love your superman "
Man, people on this site are delusional. Superman is not immune/resistant to matter manipulation. If i have to read one more post talking about superman resisting king demon bug faces matter manipulation, i'm going to punch a baby in the mouth. Anyone with eyes can see that supermans body was turned into a demon while fighting the urge to have his MIND turned into a mindless demon. It;s amazing how some people twist things. This fight is completely preposterous. Dr. Manhatten would turn every molecule in supermans body to sweet and sour sauce. Dr. M eats superman alive.... how can this even be argued 12 pages. Doc operates on a whole nother molecular level. 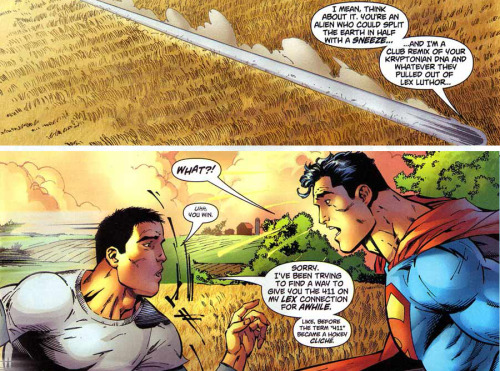 Some of the arguments here that Superman is immune to molecular manipulation is hilarious. If he was guys like Mr Mxyptlk and Allen Adam (Final Crisis) wouldn't have been able to do anything to him. Dr Manhattan turns Superman into water. "Dr. Manhattan would win. In the graphic novel and movie, the only thing tachyons can do to Manhattan is affect his ability to see the future. Big deal. " ". But as for the first, Superman deals with Kryptonian tech daily. I don't think creating Tachyon Generators would be much effort for him at all. In I personally believe he could come up with something more advance and just as effective. " Will this thread ever die? Stalemate is still the best that can be argued here kiddos. Barring the fact that Manhattan still has to even aim, and has never been shown to actually be able to affect the molecules of a living being other than disintegration, and Supes has tanked the omega effect, which can transmute, disintegrate and so forth...big blue phases, he can't hurt Supes and Supes can't hurt him. End of story. Let this thread die, people. It ends in a stalemate. Deal with it. "I agree with the second part of your post. But as for the first, Superman deals with Kryptonian tech daily. I don't think creating Tachyon Generators would be much effort for him at all. In I personally believe he could come up with something more advance and just as effective. " Tachyon machine is just a hindrance to Manhattan's precog thingy... he cud still deconstruct Supes ol'man. "Will this thread ever die? Stalemate is still the best that can be argued here kiddos.Barring the fact that Manhattan still has to even aim, and has never been shown to actually be able to affect the molecules of a living being other than disintegration, and Supes has tanked the omega effect, which can transmute, disintegrate and so forth...big blue phases, he can't hurt Supes and Supes can't hurt him. End of story. Let this thread die, people.It ends in a stalemate. Deal with it. No Superman wins. Manhattan has no feats its been established. Superman can smash thru realities and accomplish impossible feats that have nothing to do with his power set. Superman would win.